But pixels can only go so far. Nine months is a long time. And so weeks ago, back in Muggia actually, Lauren's parents had agreed to join us in Montenegro at the end of April (this was the best of a few good reasons we moved so slowly across Croatia). And now it is the end of April. And now they're here, looking lovely and three-dimensional and with far fewer beige pixelated boxes affixed to their faces than WhatsApp's low-res videochat display would have us believe. After a brief return to the bikes, it's time for yet another vacation. We drive back to Montenegro, back to our rental on the shores of Muo, a beautiful little home very literally a stone's throw from the water. We catch up and choose rooms and unpack. Bob and V spill a pile of bags and boxes onto the table, deliveries and spare supplies from America we'd asked if they wouldn't mind bringing. Following the shipments kindly brought over by Tiffany, Justin, and Molly back in Barcelona, it's like third Christmas for us. A few new pieces of clothing, some bike parts, a new phone to replace my broken one, heaps of only-at-Trader-Joe's snacks for Lauren. We rifle through them like kids on Christmas morning. We're excited for the stuff, sure, but mostly we're excited to spend the next twelve or so days with Bob and V.
And we do. We spend long, leisurely mornings at home, sipping tea and eating breakfast and talking and watching massive cruise ships manuever themselves into and out of the docks in nearby Kotor. I relish another few weeks of kitchen access, making heaps of pancakes and baking rolls and garlic knots and bread. We play board games. We walk around the bay to Kotor's old town and enjoy lunch in the shadows of its tall, weathered walls. We explore. Montenegro is a really beautiful country. Wooded and mountainous and lush, like Oregon or Austria. It's small, with a fairly flat coast and a seriously un-flat interior. Cycling inland would be rewarding but very grueling work. So we're a little thankful to be seeing the country with Lauren's parents. In a car. We take long day trips to national parks and lakes and monasteries built into cliffside caves. We drive carefully around scenic switchbacks and into rocky ravines. 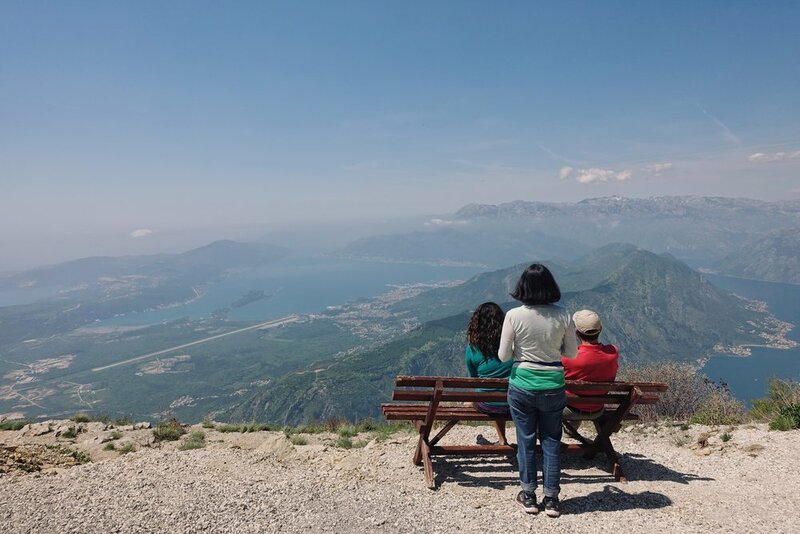 We stop at pullouts and vistas and picnic tables and admire Montenegro's many magnificent views. One day we ask a woman about a certain road we're planning to take. "Is it scenic?" we wonder. She laughs. "In my country, all roads are scenic." She isn't lying. I do my best to keep my eyes on the road (and also the scores of dangerous Montenegrin drivers, who come peeling around bends like wanna-be Fast and Furious roadsters, yet sloppy and totally unable to stay in their lane), but the dramatic views keep pulling my gaze sideways. It's a gorgeous place. We see plenty and we eat well. Bob and V generously treat us to some truly excellent meals. Lauren and I dine out very rarely on our own, traveling as we do, but for a few brief, bllissful weeks, we feast on some fantastic food. Big pizzas and tasty risottos and some of the best mushrooms I've ever eaten. We put on a few pounds. Time sometimes moves slowly. Twelve days is a nice, long chunk to cherish. But time sometimes moves quickly. Before long, nine or ten of those days have already come and gone. We leave Muo and drive back to Dubrovnik. We spend our last two nights together walking through the maze-like museum that is the walled city of Dubrovnik, which, like a museum, is somewhat artificial and full of tourists, but, also like a museum, is really pretty nonetheless. We take a walk atop the restored walls and admire the rooftops and alleys and rocky coast below. April becomes May. I turn twenty-nine and Lauren's parents pack their things (and, very kindly, a few of our things as well, no longer worth carrying around the world with us). We wake very early and drive to the airport before dawn. The airport, like we last found it twelve days earlier, is quiet and cool and empty. Last time we were here was a joyous occasion. Bob and V are coming! This time around it's a bit more somber. Bob and V are going home. It's just us and a few other passengers milling about. We accompany Lauren's parents to the check-in counter. We ride the escalator upstairs with them until Lauren and I can go no further. We thank the two of them for such a wonderful visit and they thank us for making the time and we all hug goodbye. It's a sad moment, an inevitable one, and they promise to keep us updated on their journey home. We all promise to see each other again soon. None of us is sure where or when. But soon. They turn away, passports and boarding passes in hand. We wave and they wave back. They pass through a security check and disappear into the terminal. It has been a lazy few months. Starting with the polar vortex back in Italy, we'd taken nearly two weeks off in Muggia. Then one week on the bikes, followed by almost two weeks off in Split. A few days of unpleasant but sedentary camping, another fortnight of sloth in Makarska. One week cycling to Montenegro, then two more excellent weeks with Lauren's family. For the past few months, our bike trip has been much more time off the bikes than time on the bikes. We're feeling pretty good. Pretty well and pretty rested. And now it's May, and we're itching to do a little pedaling. Asia isn't very far away. We tear across eastern Europe. Back in Africa and western Europe we'd cycle through maybe one country per month. Sometimes less than that. One state, one language, one currency. One passport stamp. Here, in the small, broken-up bits of Yugoslavia and its neighbors, we're ripping through countries every few days. Montenegro. Albania. Kosovo and Macedonia and Bulgaria. We're pushing ourselves hard and stopping little. We're gunning for Istanbul and making good progress. We're enjoying ourselves. Montenegro is great. Albania is great. We leave Montenegro in the pouring rain and as soon as we enter Albania the sun breaks through the clouds. Horses roam freely and cows graze on the roadside and old, well-worn donkeys pull old, well-worn humans in old, well-worn wooden carts. We camp at an expensive campground (our second campground in all of Europe), mostly because the kitchen area has a little awning over it to protect us from the worst of the evening's downpour, which has returned with a furious vengeance. We futilely lay out our things in the hopes that they'll dry. They don't. In the morning we turn off the main road and into the mountains, gloomy and foreboding in the distance. They are called the Accursed Mountains, and their grim stature is deserving of the moniker. We stop to watch a long, slow funeral procession in the middle of the street. Several hundred Albanians walk sullenly behind a hearse. Heads bowed, outfitted in all black. The sky matches the mood. It is cloudy, then grey, then black. We wind through the mountains and begin to climb. A few German bike tourists on holiday pass by us, full of energy and pep. We huff and grunt behind them. We startle at the crack of thunder. It begins to rain and then it begins to pour. Lightning flashes above nearby peaks. The diffused afternoon glow paints the mountains violet. A pretty sheen, besides the suffering of torched thighs and numb fingertips. We push through it, just another hour or so, descending into the small town of Koman right before dusk. The German cyclists wave us over from the roadside. They've arranged to camp in the grass outside a tavern for just a few euros, and Lauren and I join them. We set up our tent and cook a quick dinner. I'm probably asleep before nine. We have ridden until the roads run out. Koman is a dead end. Here the mountains are too untamed to drive through. Too wild and jagged to build roads over. Here, it's just harsh nature and a long, skinny lake. This long skinny lake used to be a long, skinny river. Fierce and powerful. Then the Albanians built a dam, a few decades back, and the river calmed. It rose and it drew still. It became Komani Lake. There's plenty one can say about dams. Plenty bad: neglected projects, displacement, disrupted ecosystems, less fun for whitewater rafting. Plenty good, too. Power lines run from Koman to Shkoder, whence we came, supplying the city with clean, renewable energy. The tamed waterway allows boats to navigate more safely and easily. The fledgling tourism industry here is taking baby steps. The local economy is looking up. Good or bad, what this dam and the subsequent lake mean for us is that there's a daily ferry running from Koman, where we are, to Fierze, a little farther upstream—at least when there was an upstream. Just uplake now. It's not very far as the crow flies, but the ferry, literally just an old Tirana public bus retrofitted with propellers and welded onto a barge, runs slowly. It snakes through the Accursed Mountains' fjord-like channels for the better part of three hours. It'll take us right to where the asphalt picks back up, just north of Fierze, and it'll get us there via what's often hailed as one of Europe's most magnificent boat rides. We rise early the next morning and pedal to the dockyard along with our new German friends. We board the ferry with our bikes and throttle into Komani Lake's turquoise waters. The scenery does not disappoint. It is simpy spectacular. The weather disappoints, a little. We leave in a drizzle and by the time we're really underway it's raining pretty hard. Again, for probably the hundredth time this week. Everyone is huddled inside the remnants of the old Tirana bus while I'm standing outside in my rain gear. I'm getting soaked, but the view out here is much better than from behind the steamed-up plexiglass. I'm both shivering and beaming. The ferry makes a few stops. We'd learned last night of a small guesthouse halfway up the lake, accessible only by boat or long-distance footpath. We're told it's quiet and beautiful. It's where the Germans are headed. We've been moving quickly, and could use a day of rest, and anyway this weather is no way to enjoy the splendor of Komani Lake. We haul our bikes from the boat and disembark into the tiny, nameless village. We communicate in hand gestures and maybe-understood English that we'd like to be picked up again tomorrow. Same time, same place. The captain nods and the ferry chugs away and we sure hope we've been understood. That we're not stranded here for weeks. Not that this would be a bad thing. It's lovely here. It's every bit as quiet and beautiful as promised. Grand mountains carpeted in tall grasses. Thick forest and calm, mesmerizing water. A few old houses on the hillside. There are almost no sounds: no engines, no horns, no machines droning or dinging. A few birds chirping, perhaps. Our bikes squeaking a little as we push them up the trail to the guesthouse. Our feet squelching in the mud. Otherwise, silence. Silence and the breeze. We spend a day drying out our tent and lying on a bed and sometimes watching stormclouds crash into the mountainside from out on the wide, airy terrace. When one of those clouds comes too close, clapping thunder and dropping fat raindrops on our heads, we grab our tent from the clothesline and rush back inside to our warm, dry beds. We talk with the Germans and with the marvelous guesthouse owners and fall asleep with the windows open. All night, nothing but quiet and crickets. In the morning the ferry does, indeed, return. Our German friends catch the southbound ride back to Koman and we climb onboard a few hours later as it wanders north to Fierze. The skies are so much sunnier today. The dry journey is more fun than the wet one. 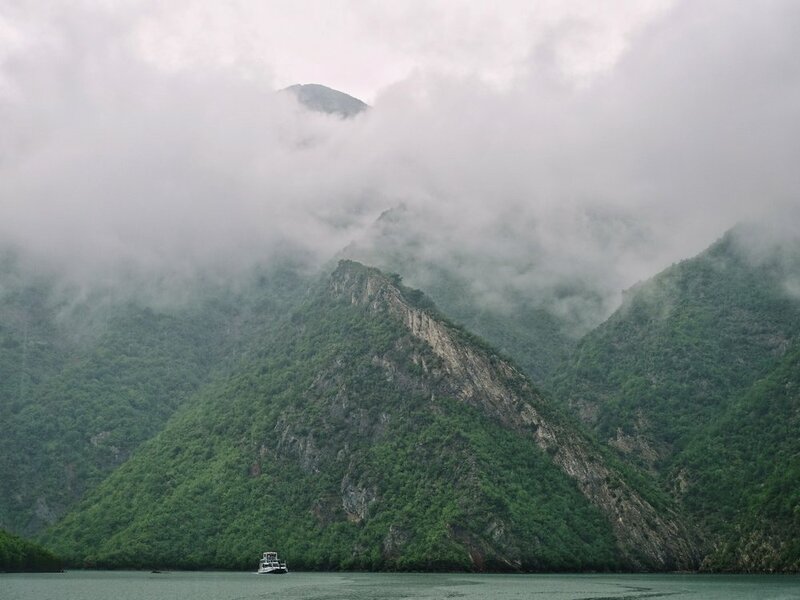 The floating Tirana bus sputters along through the gorgeous gorges of northern Albania. Lauren and I sit on the floor up front, backs against the front of the bus's chassis, our bodies vibrating from the big motor beneath us. The captain and the ferry and its passengers are in no particular rush, and the boat stops just about anywhere anyone onboard would like it to. Locals disembark onto little patches of earth and disappear into the woods. Others wave us over from atop small boulders and climb on for the ride the rest of the way to Fierze. This is a remote place, these mountains, and we're not exactly sure where these folks are coming from. How they got here, to these little swatches of mud and rock many kilometers from any semblance of road. Toward the end of our journey, an old man and old woman, certainly in their seventies and maybe much older than that, signal to the captain that they'd like to get off at the bottom of a craggy cliff on the northern bank of the lake. They haul several large sacks of supplies with them. I help them offload one, and it's quite heavy. Lauren and I look puzzlingly at each other. At this elderly couple, in their suits and dresses, shifting the weight of their bags. Ready to go somewhere. We look at the cliff above them and the cliffs around them. At our own boat, pulling away, leaving these two on what very much appears to be their own. Neither of us can discern a route up these rock faces that we ourselves would tackle without ropes and a harness. Lauren asks a friendly Albanian we've been chatting with onboard where this couple is headed. Surely they're not continuing on foot? Oh, yes, we're told. They live up there in the mountains. She points, finger tilted to the sky. Up. We look back and they've begun to climb. All throughout western Europe, when folks asked us where we were headed and we'd say Albania, their faces would drop and they'd start muttering "Oh, no, no, no." Albania, they'd tell us, is dangerous. The people of Albania will steal your spleen. Eat your eyes. Enter Albania, and you won't make it out alive. The Albanians, we're told, are just about the scariest thing imaginable. The Albanians we come across are perhaps the warmest, friendliest, smiliest, hand-waving-iest, thumbs-up-as-they-drive-by-iest people we've met on the continent. And I'm not saying that in a just-to-dispel-the-prejudice sort of way. The people of Albania have been really, really wonderful, from the moment we entered until the moment we leave the country some miles east of Fierze. All of them. The people of Albania also happen to be the people of Kosovo. More or less. Though Kosovo was recently part of Serbia (and according to the Serbs, still is), Kosovo has been previously held and settled by the kingdom of Albania, at least for bits and pieces of the eight hundred years or so the kingdom of Albania has been around. And so there are ethnic Albanians in Kosovo. Many. Albanians comprise a majority in Kosovo, but a minority in Serbia. This has caused some tensions. In the late nineties, things came to head. Serbs began killing Albanian Kosovars and Albanian Kosovars began killing Serbs. Terrible things were done in the name of patriotism and each side's cause. Torture. Executions. Civilians caught in the crossfire. There were plenty of deaths of ethnic Serbs and plenty more deaths of ethnic Albanians. There was blood on just about everyone's hands. In 1998, the Americans got involved. They backed Kosovo because some pretty awful things were being done to the people of Kosovo, but also, a little more cynically, because Serbia and Russia were allies and the Cold War burns eternal. And also because a lot of people were beginning to talk about the American president and an intern and a particular dress, and blowing things up someplace far away seemed like a pretty good way to get people to talk about something else (it worked but not as well as he may have hoped). Tanks and planes and Serbian military bases were destroyed. Peace, eventually, was assembled. The United States recognized Kosovo as an independent state—the first country in the world to do so—and a few decades passed. 1998 became 2008. 2008 became 2018. And now it is 2018, and we are Americans arriving in Kosovo, and we are surrounded by bunches of gregarious Albanian Kosovars with fond memories of American intervention. And people just love us. The people of Kosovo are splendid. They're really friendly before they even realize we're American, and then once they discover where we're from it's a damn party. They buy us drinks. They wave us over to join them in their cafes for coffee. They want photos with us. They show us their posters of Elvis and Marilyn and point proudly to the American flags flapping above their businesses (American flags outnumber Kosovo flags here about fifty to one; only Albanian flags are more plentiful). They tell us about their favorite presidents (usually George W., followed by Clinton, then George H.W., with a generally positive impression of Obama and a mixed reaction to Trump). Most of this happens in the in-between language of English and Albanian with a little German and great heaps of improvised sign language. Lots of gestures of planes taking off and lots of sound effects of explosions. Lots of head-nodding from us. We sit on the side of the road, taking a break from Kosovo's gentle, scenic hills, and kids come over to share their snacks with us. We ask to camp behind a bakery and the owner invites us to camp in the spacious back room instead. We try to buy a little bread the following morning, as a thank you, and the cashier refuses to take our money. The next day we ask to camp behind a gas station and a kid working there brings us Coca-Colas and helps us set up our tent. When we attempt to purchase a few drinks in appreciation, the crew working the gas station tells us it's on them. It's like this everywhere we travel in Kosovo. It's raining one day. Actually, it's hailing. It comes out of nowhere and nearly blows us off our bicycles. We brace ourselves against the seeming monsoon and, when the road is clear, rush across to an awning outside a closed liquor store. The storm is blowing sideways, so it doesn't exactly provide much cover. But it's something. A man materializes out of the wall of rain and brushes past us. He unlocks the door and ushers us inside. He waits with us for the storm to pass. When the torrent becomes a drizzle and we continue on, he locks up the liquor store once more and walks back home across the street in the mist. He'd seen us from a window, I guess, and just wanted to help out. Kosovo is pretty and wonderful and unfortunately quite small. So it doesn't take very long, even stopping for coffee with strangers several times per day, to cross it from west to east. 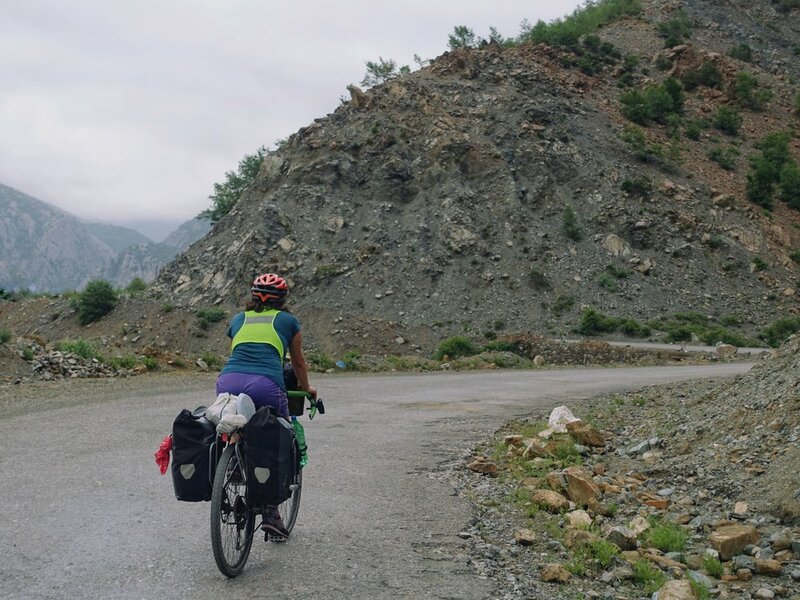 We ride through the countryside and begin a steep, twenty-kilometer climb to the Macedonian border. We're just getting started when a police van pulls up next to us. We stop and they stop. They can tell that we're not from around here. 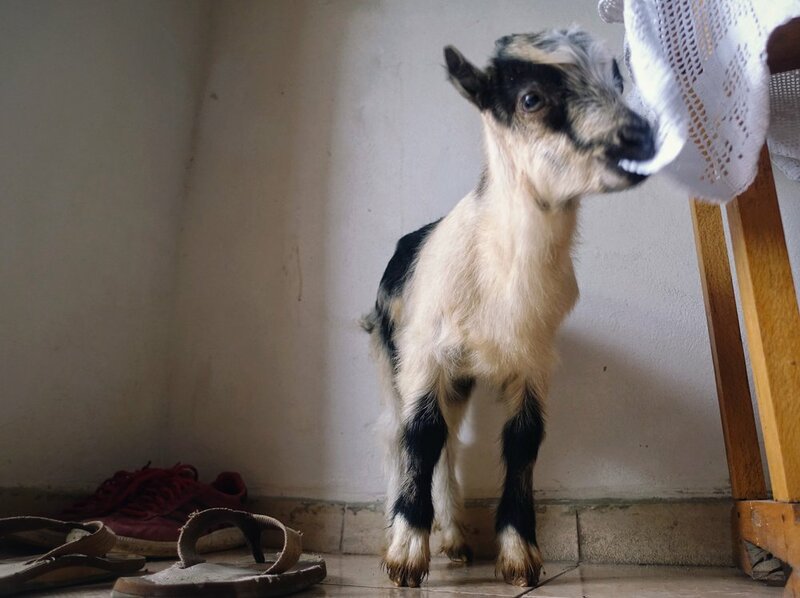 "Where are you going?" they ask. "Macedonia!" we exclaim proudly. "Not on this road," comes the stern reply. This border, it turns out, is closed. It closed down six months ago. If we try to cross it, the officers tell us unenthusiastically, they're going to have to fine us three hundred euros. Plus, we won't get an entry stamp, and that might make exiting Macedonia difficult later on. "So, uh, where do we go?" I thrust the map on my phone screen into the open window. They point to a border, a few dozen kilometers north of here and up an even steeper hill. "Here," the officer on the passenger side of the van says. "Through Serbia." Lauren and I glance at one other. "But ... we weren't planning to go to Serbia." The problem is not that it wasn't part of the plan. Our plans change all the time. The problem is that we're pretty sure we can't actually enter Serbia. Remember twenty years back, when the United States became the first country to recognize Kosovo as an independent state? In the past twenty years, most other countries have done the same. They've acknowledged and built relationships with Kosovo. Serbia can't seem to let go. Like a desperate and abusive ex who insists it's not yet over, Serbia still claims Kosovo as its own. Which at this point doesn't really mean a whole lot. What it does mean, though, is that when we entered Kosovo from Albania, we entered through a Kosovar border post. Not a Serbian one. Serbia considers it an illegal entry into what Serbia considers Serbia. And so if we cross one of the "checkpoints" between Kosovo and Serbia (these can't be called border posts because, according to Serbia, there's no border), Serbia will look at our passports and ask where this funny, official-looking stamp from the Republic of Kosovo is from. What's the Republic of Kosovo? they'll ask. Never heard of it. And hey, wait a second. How'd you get into our country anyway? Most likely, they won't arrest us. Nor will they deport us. They just won't let us into the Serbian part of Serbia. According to Serbia, the only legal way to enter Kosovo is to first enter Serbia, then enter Kosovo from Serbia, and then, sure, you can reenter Serbia from Kosovo. because you have a Serbian entry stamp. But no stamp, no entry. At least, that's our understanding. That's what we'd read before getting stopped on the side of this road, weeks and months earlier. The police officers have already pulled away, and we are now just standing here, an hour before dusk, wondering exactly what to do. We ask a few people nearby. But they only speak Albanian and we most definitely do not speak Albanian. Discussing the particulars of border crossings requires vocabulary we have not mastered. We pull into a gas station. The friendly owner speaks very little English but does his best. He calls a man over, and that man calls another man, and soon, we are in a big circle of about fifteen Kosovars. They're all trying to help, or at the very least understand what it is we need help with. Google Translate, with the assistance of a friend of the gas station owner who speaks a bit more English, finally gets our problem expressed to the others: We want to cross into Macedonia, and we were told that this border is closed. Oh, just go ahead anyway, they all chuckle. No one's checking and you can just push your bikes around the barricade. But, but, we need an entry stamp. Crossing the border illegally wouldn't be a problem if we were going to Macedonia and then coming back to Kosovo, but we need to exit from Macedonia to Bulgaria. No stamp, no exit. The crowd murmurs amongst themselves. Heads nod. We just need to know whether, if we bike all the way to the Serbian border, if the Serbs will let us in. Are they really strict about this entry-stamp-from-Serbia thing, or is it more of a depends-how-the-border-agent-is-feeling thing? The Kosovars deliberate. They may let you in. This seems like good news. Our translator does his best to explain this next sublety. But the thing is, you are ... American. Serbians, Americans ... He wraps his hands around an invisible throat in front of him and squeezes. We catch his drift. The Kosovars, they love us because it was America that blew up the tanks and planes that were killing them. It was America that gave Kosovo its independence. The Serbs see it differently. To the Serbian government, it was their tanks and planes that America blew up. Their land that was taken from them. In Kosovo, Americans are beloved. In Serbia, our people have not left a good impression. We are stuck. The sun dips below the horizon. Serbia, America ..., the crowd that has grown around us mumbles. Necks gesture agreeably toward our miming translator, strangling the dusty air. His grip around the invisible neck tightens.